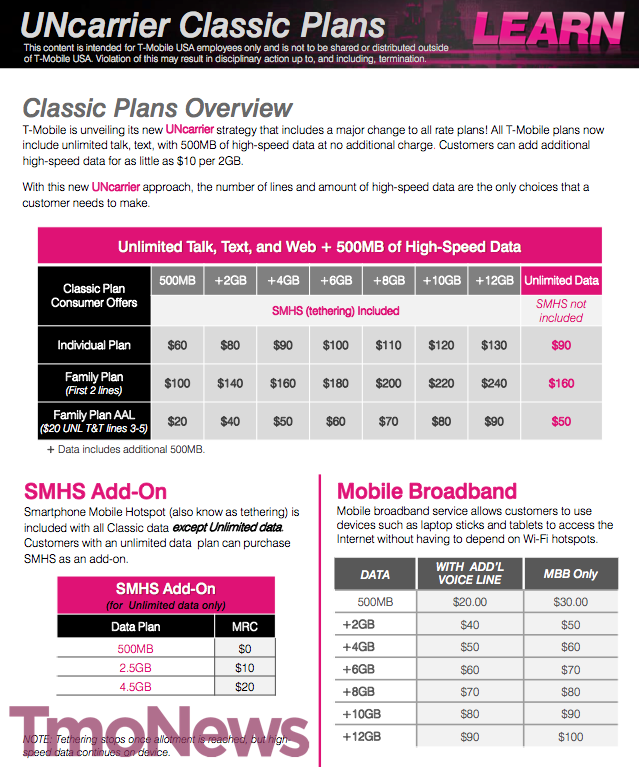 On March 24th, T-Mobile is set to introduce their “UNcarrier Classic Plans” that will affect all of their current rate plans going forward. Once in effect, all of T-Mobile’s plans will include unlimited talk, text, and be bundled with 500MB of data. If you need more than 500MB of data per month, you can easily upgrade and throw on however much you need, with each 2GB costing $10 and up. Below is a screenshot of the information that is being sent out to employees, giving the basic gist of what customers should expect. As for what will happen to everyone’s current rate plans who are already signed up on T-Mobile, the answer is nothing. No one is forcibly moving you to the new rates. Once the plans go live and more information is officially announced, we will learn more about grandfathering and all of that. These new Classic plans will only be available through third party national brick and mortar stores and online retailers. As long as you are not in a corporate store, you can grab these new rates.